Whatever the purpose of your stay this exquisitely restored Victorian Town House Hotel in Leicester will charm you with its Grace and Elegance. Formerly a convent, The Regency Hotel and Restaurant retains its charming historical features. 32 Tastefully decorated en-suite bedrooms all with modern facilities, Flat Screen TVs , complimentary WIFI, Tea & Coffee facilities. Click on the link for an example of the treatments available to guests or please ask reception for more details. The ‘Town House’ Restaurant which is open to both Guests and Non-residents, specialises in Traditional and Modern A la Carte cuisine within our elegant Victorian surroundings. Alternatively if you would like things simpler but with the same top quality ingredients then our “Langtry’s” conservatory is perfect. Serving a much more informal menu, such as Pasta’s, Fish and Chips, Jacket potatoes and Wraps. See our Sample menu’s from the left. 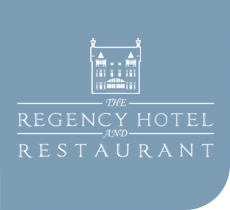 The Regency Hotel in Leicester also provides Function Rooms and Meeting Rooms in Leicester and Catering for Weddings calling on the experience we gace gained as a leading Wedding Venue Wedding Venue in Leicester.